I would like to tell you a little about my business. I have been involved in the doll business since 1979. My mother, Cathie Lee Lipski, started the business in an upstairs store on St.Charles Rock Road, in St. Louis Mo. Her humble beginning was at the top of a long flight of stairs, in a small room were she sold her restored dolls. She would clean, repair, and design dresses to bring back the splendor to well loved dolls. She did so well she moved to a larger store front on Woodson Road. This is when I got involved in her business. We moved two more times, each time to a larger store. In 1990 she developed cancer and asked me to carry on her business. She didn't want everything she worked so hard for to end. I promised that I would carry on were she left off. This is the reason for the name of my company "CATHIE LEE DOLL HOSPITAL". The store sits on a park like acre. 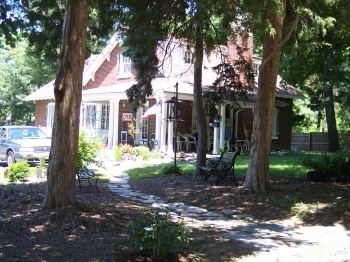 The store is a custom build home from 1920. Built by a well know family in our area. With all the charm that this home has it has made a wonderful doll shop! If you are in the St. Louis area you have to stop by and see all the doll supplies, and collector dolls that we carry.